Research suggests high-quality care and learning programs that begin early in life carry the potential to improve developmental outcomes as well as close gaps in academic achievement for young children. This is especially true when the care is relationship-based. However, the observed quality of care in infant and toddler settings is low in general and often lower than in preschool settings. The brief focuses on implementation and standards in child care centers because, in general, family child care homes are already structured to support relationship-based care practices from infancy through age three due to small numbers of children and caregivers. However, these considerations for implementing relationship-based care practices may also be relevant for group child care homes. More than half of California’s infants and toddlers receive care in child care centers, in family child care homes, and with relatives or neighbors outside the home. 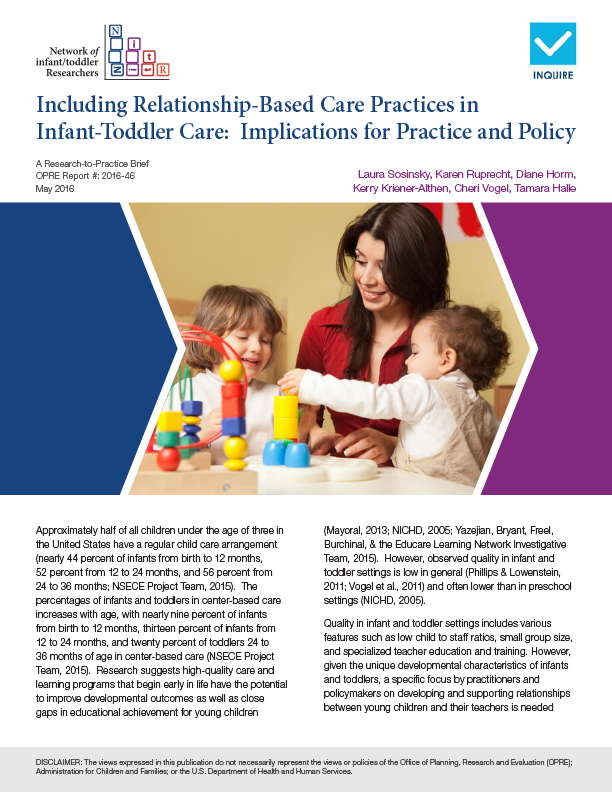 This publication, codeveloped by WestEd's Center for Child & Family Studies, presents information about how to provide high-quality early care and education, including recommendations for program policies and day-to-day practices that will improve program services to all infants and toddlers.